In a published pattern written instructions will give the number of stitches, and the number of times the charted pattern is to be repeated in each round or row. Elements like welts and bands of plain knitting are not generally included in a chart. 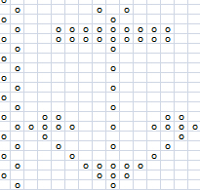 There may be several charts for the different pattern elements of one garment. If you are working in rounds, you will start each round at the right hand side, moving up to the next line at the start of each round. If you are working back and forth on two needles your second (wrong side) row will start at the left hand edge of the chart. When you are knitting a wrong side row you need to read the symbol for purl stitches as knit and vice versa. Stitches which appear as plain stitches on the right side of the garment are generally represented by blank boxes. 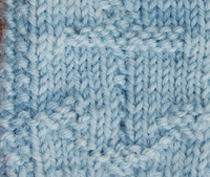 In this example the cable is worked over two stitches; the first stitch is put to the back of the work, the second stitch knitted, then the first.